Well, not exactly buttah. I cheated and didn’t use a strainer or food grinder, so my apple butter is lumpy. But, hey, it’s apple butter. I got fancy yesterday and used the food grinder on the applesauce. It’s more like buttah than the apple butter. Oh well. I heard someone on election night say that everyone will remember exactly where they were when Barack Obama was elected president. Yep. I was at home. Making apple butter. Congratulations, President-elect Obama, on your victory. You said you need my help. You said you will be my president too. You said you hear my voice. Well done. And good luck. Ooooooh! I haven’t had Apple Butter on Toast since my Grandmother passed away. She used to make really good Apple Butter. Good on you. Keep those traditions alive! I knew I liked you! 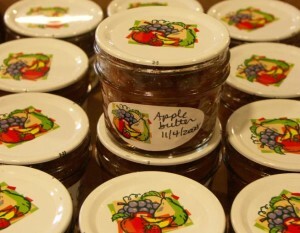 Can I buy some of that apple butter?